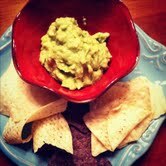 Made a batch of guacamole yesterday, there are so many recipes out there and really there is nothing special to mine. Only that it is tomato and onion free (for those preferring that option). Personally I love onions and tomatoes but this is a quick guac that even my tomato hating friends will dip. Dice the avocado and put into a large bowl. If you are unsure of how to quickly dice an avocado check THIS post out. Smash in the bowl. I prefer a good old potato masher. Add the juice from one lemon and one lime. If preferred add a little zest from each. Mix well. Add crushed garlic (I LOVE the garlic press from Pampered Chef), salt, pepper and cumin. Mix well and taste. I use a tortilla chip when tasting, instead of a spoon. This helps me gauge how much salt is needed. I tend to keep my guac less salty as I buy salted chips. Add seasoning as needed. Top with chopped cilantro and serve immediately. Any leftovers can be covered and kept in the icebox for up to three days. Stir well before serving. (The combination of both juices is what helps prevent browning). And here is a photo of the batch I made yesterday. It's still green! I always hear of people saying their guac turns brown, which I have never understood. Only explanation I have is that I use both lemon and lime juice. I don't know! But guac doesn't last more than 2 or 3 days around here anyway! I apologize for the delay in my response! Thank you so much! I'll check out your link!